Ryouta and Himeko put their daring plan for escaping the island into action, but will they succeed? Having defeated Kira to save Oda and Kinoshita, Ryouta and Himeko appeal for Oda’s help for their plan to hijack a helicopter and escape the island together. Afterwards, Ryouta and his team take the time to plan their attack, revealing their trump card which will give them the edge in overpowering their captors. However, the trust holding their group together is tenuous at best, with expected and unexpected betrayals putting their plan into jeopardy. After several volumes worth of waiting, Ryouta’s plan to escape the island finally becomes reality in the exciting second half of this volume. I was decently worried going into this volume that what we’d get would be little more than cliche, and clearly author Junya Inoue was cognizant of this as this volume played straight into my fears before knowingly swerving back and forth during the final action scene. While nothing that happens feels particularly groundbreaking, these plot twists made sense given the personalities of these characters yet still had me wondering about their various allegiances. These kept the escape scene engaging and made up for the action being less intense compared to other battles we’ve seen so far in this series. While I was disappointed we didn’t get to the end of their escape attempt in this volume, I’ll be eager to see how it turns out in the next. While I enjoyed the escape scene, I was somewhat disappointed by the pacing of this volume as the first half is largely exposition that isn’t handled particularly efficiently, going on for longer than necessary to convey the point at hand. This is most apparent in the several scenes where the group had to speak via cellphone to avoid being overheard, and Inoue decided to convey this with panels showing the actual dialog on the phones. I got the sense that this could have been handled in a much smoother way by compressing the dialog into thought bubbles, speeding up these scenes to get to the action. While the problems with pacing in the first half of this volume could be forgiven if there was more of a point to the extended proceedings, this volume also didn’t deliver any new character development for the main characters. While the last two volumes showed Ryouta growing as a person, his character development feels stagnant in this volume. For example, it felt somewhat silly that at this point in the story Ryouta is portrayed as shaking after killing anonymous soldiers in battles during their escape attempt considering he’s been faced with having to kill people who he has actually familiar with on several occasions. On the whole, this volume didn’t do a whole lot other than moving the escape plot forward, which strikes me as a missed opportunity considering the amount of time wasted on exposition in the first half and this is a disappointment compared to the character development shown in the previous volume. It also bears mentioning that despite the Tyrannos Corporation which oversees the game becoming an increasingly big part of the story, Inoue has yet to really give us a reason to care about their actions beyond simply being your typical evil company. While we finally get some more background to Tyrannos as well as an indication of their overall aims, there is nothing here that I found particularly interesting or that impacts the plot in a meaningful way. In addition, we are introduced to higher ranking members of the company but they are not consequential to the story at all, and it feels like Inoue is simply throwing them in as a clumsy way to show the readers that things are getting serious. I really hope that if Tyrannos is going to get more focus and become more of a major plot-point in the future that there is more to them than the boring “reveal” we get in this volume. As is expected from BTOOOM!, this volume’s art remains a great reason to keep up with this series as it remains crisp and action scenes are portrayed exceptionally well. If you’ve liked what you’ve seen so far from this series in terms of art, this volume won’t disappoint you even if it it lacks the amount of action seen in the previous volume. 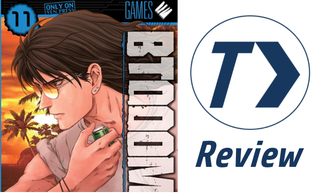 While my review of this volume may seem more on the negative side overall, BTOOOM! is absolutely still a series that I can recommend as the action scenes and overall plotline make for an exciting read. While this volume is a good deal more sluggish than the last few and lacks the same amount of action or character development, I still enjoyed it on the whole and it ends on an exciting note as Ryouta’s plan to escape reaches its climax. Even though BTOOOM! certainly had some missed notes in this volume such as the reveal of Tyrannos’ intentions, it seems as though events on the island are finally reaching a climax and I can’t wait to see what happens next. BTOOOM! Vol. 11 was published by Yen Press on August 18th, 2015. Authored by Junya Inoue, the series originally began in 2009 and is still ongoing in Shinchosha’s Comic Bunch magazine. The series received a one season anime adaption in 2012 and volume 12 will be published in English on November 17th, 2015.